LONDON – Super Bowl champion Aaron Ross spoke of his satisfaction after his wife Sanya Richards-Ross completed an incredible sporting year for the family by winning Olympic 400 meters gold. Ross, who won his second NFL championship with the New York Giants in February, made a frantic trans-Atlantic dash to watch his wife in action at the Olympic Stadium after being granted special dispensation to miss two days of training camp by his new team, the Jacksonville Jaguars. "This moment, this was basically like her Super Bowl," Ross told Yahoo! Sports as he stood in a media room beneath the stadium. "I was just excited more than anything to see this outcome. It has been a really good year. She was with me on my ride all the way to the end and I wanted to be here for her to join her ride. "She worked so hard. All the emotions going through her mind, my mind, her family's mind, everybody that has seen the struggles. It is just a great moment." Ross was due to return to Florida on Monday morning, meaning that he would spend just 48 hours in London and miss three days of training camp. He revealed that Jaguars head coach Mike Mularkey and his staff were fully in favor of him taking a short period of leave in order to share in his wife's special moment. "It was pretty easy," Ross said. "The coaches were all a man with me. They wanted me to come here and enjoy the moment with her, so that is a great organization. I'm going back tomorrow so I will only miss three days." Richards-Ross missed out on gold in Beijing four years ago despite going into the final as a heavy favorite, but made no mistake this time around. She held her nerve when Russia's Antonina Krivoshapka went out at a blistering pace and held off a late challenge from defending champion Christine Ohuruogu of Great Britain. DeeDee Trotter of the U.S. placed third. 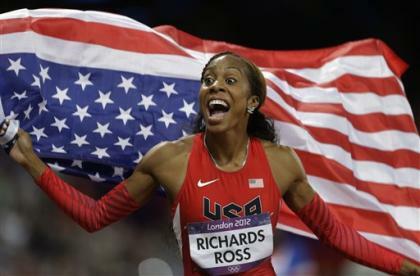 The 27-year-old Richards-Ross, who met Ross when they were at the University of Texas, was moved to the verge of tears when talking about her husband after the race. "He supports me in everything I do and I try to do the same for him," Richards-Ross said. "It has been a great year for us and it means the world for me to have him here watching me. He got his Super Bowl and now I got the gold medal." The pair has regularly spoken about how their relationship has been helped by the fact that they understand each other's dedication to their profession. Even in London, Ross undertook two private training sessions in a local gymnasium. Richards-Ross did the same thing in Indianapolis during Super Bowl week.